Alpha Centauri Press, 2017, 300 pp. 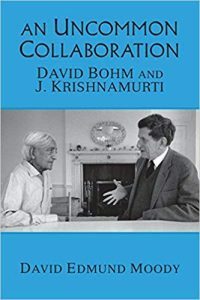 The author is surely correct in describing the collaboration between Krishnamurti (1895-1986) and David Bohm (1917-1992) as uncommon, since, as he points out, most collaborations take place within the same discipline. There is no doubt that they were both men of genius, deeply concerned with the human situation, its limitations and prospects. It is useful to think of Krishnamurti as a psychological philosopher, or even as a philosopher of mind; David Bohm is as much a philosopher as a physicist, and he was someone with a subtle and probing mind always trying to reach the ground or root of an issue. In that sense, both men were radical thinkers. Bohm learned of Krishnamurti’s work through reading The First and Last Freedom, with a foreword by Aldous Huxley. He wrote to the publishers and the two men met in London, leading to a total of 144 recorded dialogues, some of which were published in two volumes, The Ending of Time and The Future of Humanity. David Moody is in a unique position to write this book, having worked closely with both men when he ran Krishnamurti’s Oak Grove School – and he had scores of long walks with Bohm, where he was able to absorb as well as probe his ideas. The book gives useful biographical background of both men and their interactions, looking in more detail at central themes in their dialogues, with some useful appendices, three of which feature David’s own dialogues with Bohm. One of the concerns that brought the two men together was wholeness, incorporated in the title of Bohm’s best-known book, Wholeness and the Implicate Order (1980), which I read in 1983 after hearing Bohm speak at the Mystics and Scientists conference. Both men addressed thought and its fragmentation, of which more below. For Bohm, this was associated with the mechanistic and reductionist approach of science analysing things into discrete, separate units. This gave the wrong basis, which they both felt should be the ground or undivided wholeness, from which the explicate order of separation arises. In his 1980 book, Bohm used as a point of departure undivided wholeness, which both relativity and quantum theory have in common. Undivided wholeness means dropping the primacy of the mechanistic order and seeking a deeper ground of reconciliation where ‘both relativity and quantum theory are to be derived as abstractions, approximations and limiting cases.’ (p. 173) Bohm speaks further about this elsewhere in the book, where he points out that, like Newton’s theory, relativity is based on the idea of perfect continuity, while quantum theory violates continuity by definition. This makes one wonder whether the polarity of continuity and discontinuity can be resolved at a deeper level, as Bohm proposed. Even more interesting is the point at which theory breaks down, which Bohm feels is at the Planck length of 10 -33 – this involves constants from relativity, gravitational theory and quantum theory. The structure of the electron has only been investigated down to 10 -16, so Bohm points out that there is a long way to go. He states that fluctuations in the gravitational field increase with shorter distances, so at 10 -33 space and time become indeterminate. This sheds new light on scientific hypotheses as approximations by defining an absolute limit to theoretical validity. The dialogues draw a distinction between intelligence and thought. Intelligence gives rise to insight, which, it is argued, is beyond the operation of thought. While thought is tied to time and the ego, insight ‘is neither matter nor a material process; it is instantaneous, a flash of light, a form of pure perception.’ (p. 124) Bohm adds that ‘the operation of intelligence is the absence of movement of thought.’ (p. 200) This leads to a more detailed consideration of the nature of thought, which runs through the volume. The thinker or observer introduces what both men felt was an artificial division in consciousness; they maintained that the thinker is the thought, the observer is the observed, and that the very existence of the thinker is created by thought. Some of the most interesting conversations explore the relationship between the ego, time, becoming and the ground. To live from the ground is to be undivided, while the ego living in time is trying to become something other than itself, a paradoxical aim. My only question in this respect was that Krishnamurti makes no space for the witness aspect of consciousness. More generally, thought as a system – including feelings and the state of the body – is the source of our most intractable problems. As Einstein also observed, problems cannot be resolved with the same kind of thinking that originated them, and it is interesting to wonder if he actually discussed this question with Bohm while they were together at Princeton. Krishnamurti expresses the view that our civilisation is highly cultivated but also barbarous, so the question becomes: can we in fact go beyond our conditioning? Bohm tried to do this with his practice of dialogue in which assumptions are consciously suspended as we try to reach a deeper understanding of other people. A greater awareness of the limited nature of thought and therefore of fixed positions would help enormously in addressing our pressing global challenges. Appendix 4 is a fascinating dialogue on physics and the laws of nature, in which it becomes apparent that Bohm is very well informed in pre-Socratic philosophy, which is probably the origin of the search in physics for one basic underlying principle – for Thales this was water. More generally, Bohm sees physics as the systematic study of nature using reason, observation and experiment. He regards the essence of the universe as mathematical relationship and stresses that the essential principle of the physical world is contained in equations rather than verbal concepts. Theories are symbolic structures, interpretations that can be tested by experiments, the primary function of which is to answer questions raised in theories. David Moody has rendered a huge service to studies of the Krishnamurti/Bohm dialogue, not only for his clear and sympathetic elucidation, but also for the way in which he engages readers in this same quest for understanding human consciousness – after all, we all have own thought systems that require more rigorous self examination. Buy An Uncommon Collaboration here.